Advising G8 countries on how to improve the climate for social impact finance. Helping military veterans obtain discharge upgrades so they can access benefits like health care and tuition assistance. Co-hosting community law clinics with in-house legal departments. Securing rulings that uphold constitutional safeguards for criminal defendants. Advocating for legislation to criminalize sextortion. The impact of our pro bono program is broad. It is also one of the most important ways we measure our professional success. In 2017, 96 percent of our U.S. lawyers exceeded The American Lawyer’s 20-hour pro bono standard. Our lawyers contributed 105,000 hours to pro bono representation last year. That’s the equivalent of a 58-lawyer practice group dedicated full-time to pro bono. 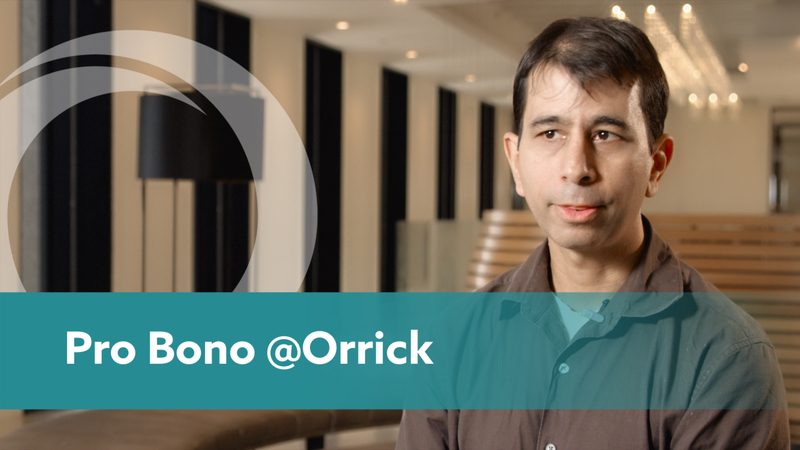 Orrick is ranked #3 in the U.S. for pro bono contributions. We’re also helping lead the development of a pro bono culture internationally – and rank 6th among U.S.-based firms for our worldwide impact. Our program is led by full-time pro bono counsel Rene Kathawala based in the United States, and full-time pro bono lawyer Amy Heading based in UK/Europe, and we are fortunate to have strong partnerships with public interest organizations around the world. Our teams are having meaningful impact locally and globally through litigation, transactional work and the shaping of public policy. Orrick has been named to the National Law Journal’s 2018 Pro Bono Hot List, which recognizes the most significant pro bono work of the past year. Rene Kathawala serves as Orrick's firmwide pro bono counsel, responsible for managing and initiating the firm's pro bono activities, including all administrative and legal aspects. Rene works with other pro bono counsel and legal services nonprofits to increase the quantity and quality of pro bono representation that is being provided to indigent clients in each of the cities worldwide where Orrick has a presence. In addition, he supervises and directly works on cases in such diverse areas as immigration law, family and matrimonial law, housing law, public benefits law, employment law counseling, impact litigation and nonprofit advice and counseling. Rene has worked on many substantial matters in the federal and state systems over his career that are reported as precedent. He also works with firm attorneys to strengthen the firm's innovative Impact Finance team that he founded and that provides representation in diverse transactional areas to nonprofit, for profit and hybrid organizations dedicated to providing basic services to poor persons around the world in areas including microfinance, water, education, energy, housing and health. Immediately prior to joining Orrick in his current position, Rene served as a law clerk to the Honorable I. Leo Glasser, United States District Court for the Eastern District of New York, between September 2004 and August 2005. He was an associate in Orrick's employment law department between October 1996 and July 2004 where he practiced in general labor and employment counseling and litigation, with a focus on trade secrets. During that time, he initiated a formal pro bono program in the New York office and served as the pro bono coordinator for the office. Amy is based in our London office and leads our pro bono practice and community responsibility programme in our 13 international offices across the UK, Europe and Asia. Amy works with a variety of international, national and local non-profit organisations and charities to identify their legal needs and to develop and facilitate tailored pro bono legal training, assistance, advice and representation. She also builds strong partnerships and networks with these clients and other partners such as law centres, academic institutions, government institutions and UN agencies to collaboratively develop high impact pro bono projects that use the law, policy and advocacy as tools for social change and development in the areas of human rights, conservation, rule of law and access to justice. Amy also leads on the further development of the impact finance and social enterprise pro bono practice across the international offices, facilitating legal services to clients seeking to achieve positive social and environmental impact alongside financial returns. Amy contributes to the continued development of the pro bono sector in the UK, helping to lead on initiatives such as the UK Collaborative Plan for Pro Bono and UKAdemy Pro Bono Training Programme. She also works to involve the firm's commercial clients as trusted partners in select pro bono projects, supporting the development of in-house pro bono. Amy has many years’ experience advising the private legal sector on the strategic development and management of pro bono programmes across a number of jurisdictions. An Australian qualified lawyer, Amy holds graduate and post-graduate degrees in the areas of law, human rights, international development and psychology. Congratulations to Orrick Pro Bono Counsel Rene Kathawala on receiving the 2019 Pro Bono Counsel Award from Her Justice. An Orrick Public Finance team provided pro bono legal counsel on a special election that raised $2.5 billion for flood-prevention projects. Orrick is pleased to be named Pro Bono Partner of the Year by our longtime partner organization Swords to Plowshares. In this lengthy New York Times column, Nicholas Kristof details the compelling case of California death row inmate Kevin Cooper. An Orrick pro bono team and the American Civil Liberties Union of Nebraska filed a lawsuit challenging the state’s execution protocol. An Orrick pro bono team filed a class action lawsuit against New York’s family court system for failing to comply with statutory deadlines. An Orrick team played a large role in a new report that looks at the relationship between domestic violence and economic empowerment. In an issue of first impression, Orrick’s pro bono team has set California law with regard to the financial support of immigrants by their sponsors. New York Law Journal, "Lawyers Who Lead by Example"